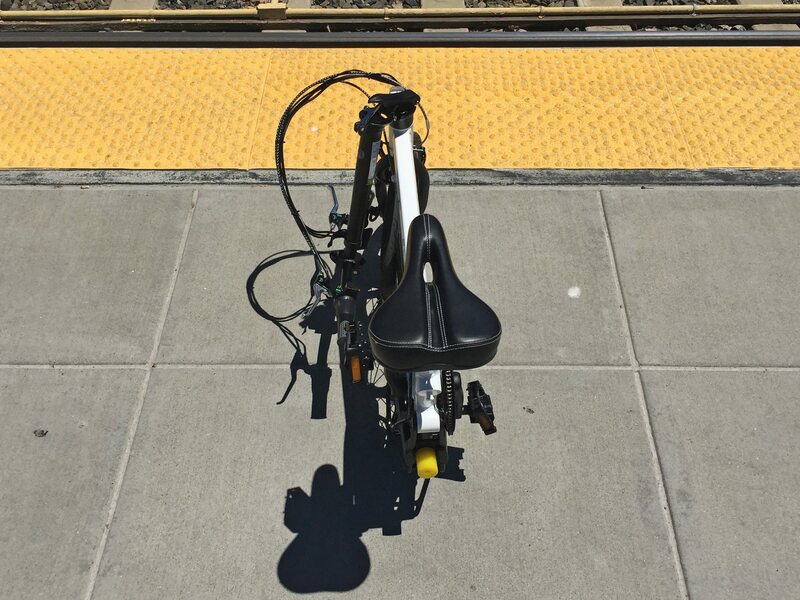 Folding bikes have many uses… not all of which are immediately obvious. Petite riders regularly seek them out because of the low easy-to-approach standover height, shorter reach, and lighter overall weight. 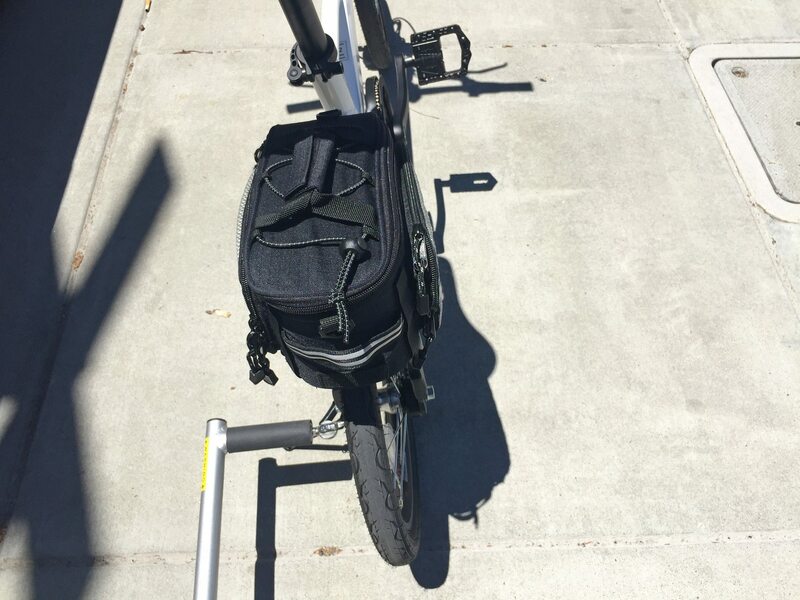 Boaters, RVers, and even private plane operators appreciate the compact size which allows for a pre-fit, familiar bicycle and gear to be brought along on new adventures. 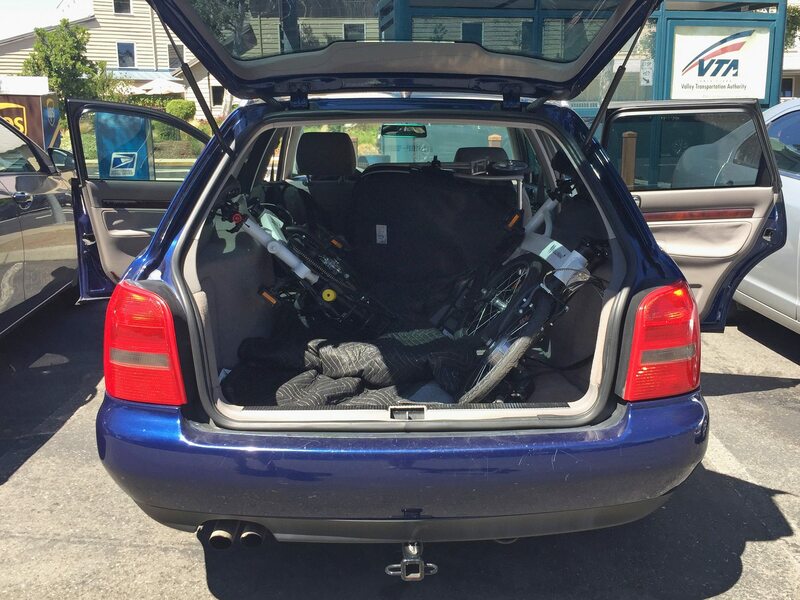 But unfortunately, many electric folding bikes just aren’t that light or compact. There’s a direct inverse relationship with size, power, frame strength, and cost. 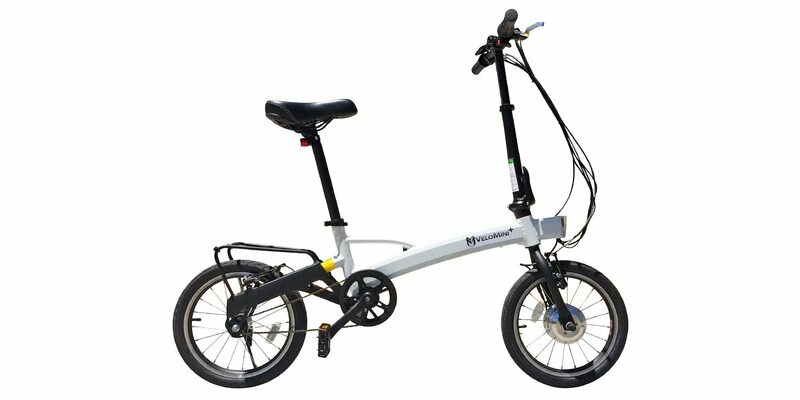 I regularly see cheap folding e-bikes that are just as heavy as full sized models, difficult to break down, less stable, and less comfortable. 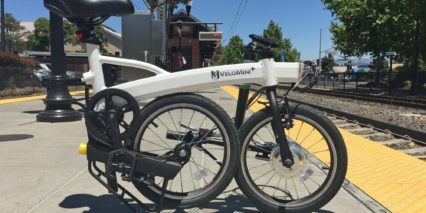 Now, the VeloMini doesn’t solve all of these problems, there are still trade-offs being made. 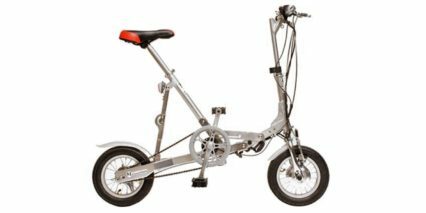 But it is one of my favorite folding ebikes because of how easy it is to fold and how lightweight it is. 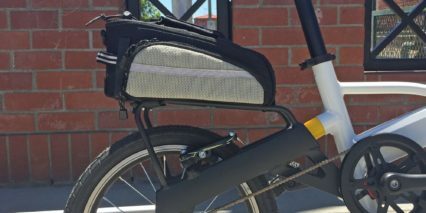 This is a product that gets compared more with electric kick scooters than ebikes. 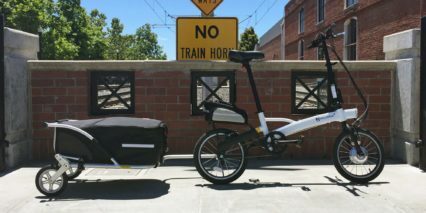 It delivers a similar form factor (a bit longer than wider when folded) and doesn’t stand out as much as the products with removable battery packs and larger rear mounted motors. You don’t get the same top speed or range, but it charges so quickly (in around two hours) that bringing the compact one-pound charger along is no big deal. 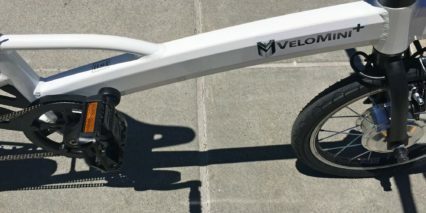 The original VeloMini products weren’t as handsome and “normal” looking as the latest Plus model. 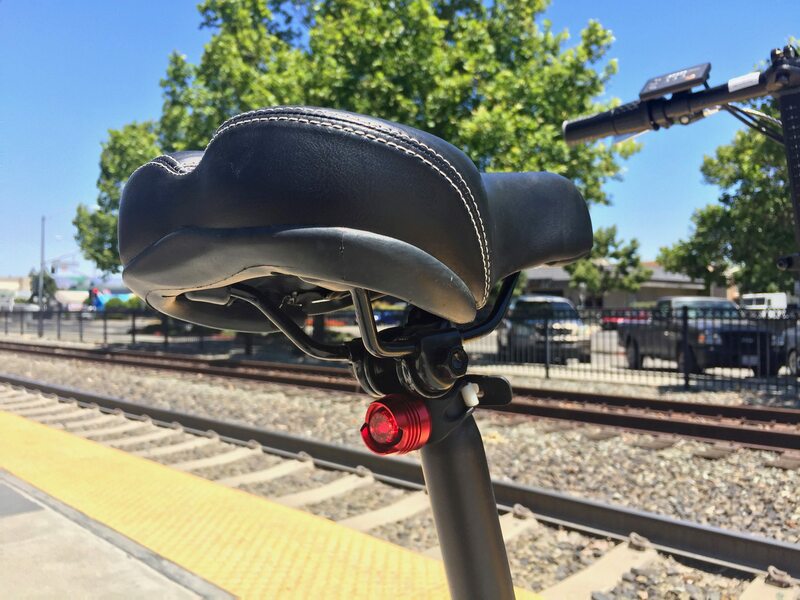 This is a product that has been refined over the years, since 2010 when they launched in America, it can now seat taller riders thanks to an elongated seat post and telescoping stem and despite the single-size option, can accommodate up to 260 lbs of rider weight and gear plus 50 additional pounds if you get the folding T-1 Trailer. 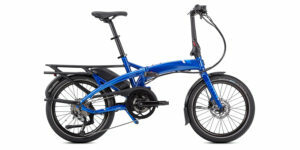 Priced at $1,295 MSRP, the VeloMini+ isn’t as widespread in shops as some of the cheaper full-sized folders, but they do ship in the US and Canada and assembly consists of a three-step unfolding routine. The same three steps you’ll take to re-fold and unfold every time you use it. 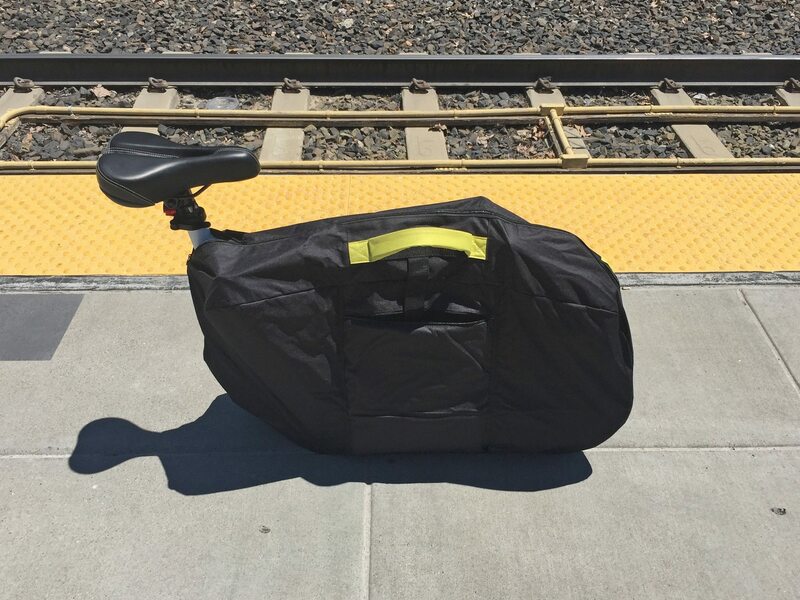 With narrow 16″ wheels, this isn’t a trail bike and you don’t get fenders for damp days, but the rear rack (when covered by the optional $29 lb trunk bag) keeps your back dry. 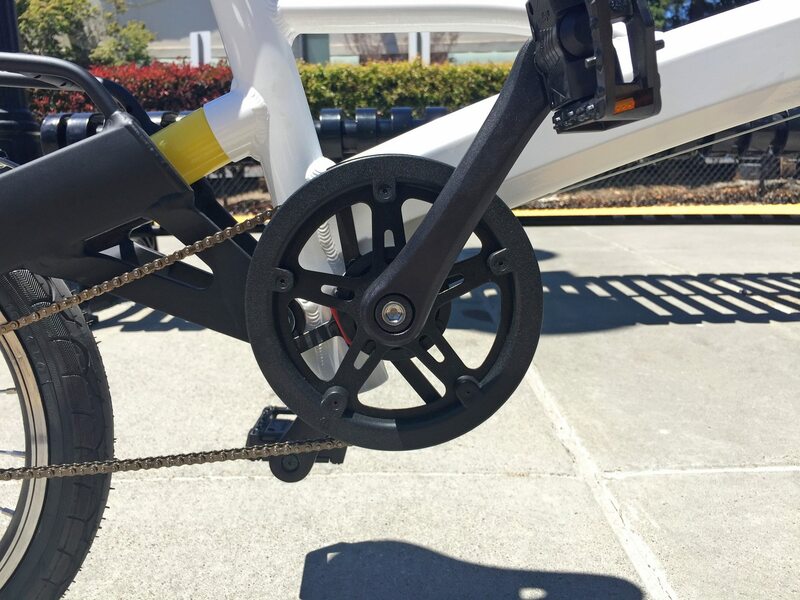 Driving the bike is a compact 250 watt nominal, planetary geared hub motor. 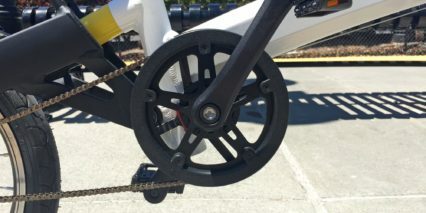 They mounted it in the front wheel which keeps the single-speed drivetrain simple and clean. 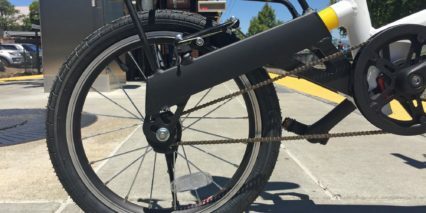 Changing flats on this bike isn’t an ordeal but without quick release wheels, you will need to bring along an adjustable wrench or pre-sized toolset. 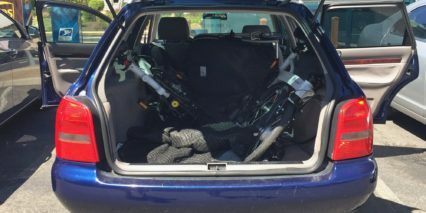 Consider purchasing additional inner tubes for the unique size and possibly Sliming the tubes and carrying a mini-pump in case you get a flat. The tires are narrow but rated to a higher PSI range of 40 to 65, stay towards the upper end if you weigh more or are carrying cargo. If you go off a curb or hit a deep pothole at speed, the tire can squish up and push the tube into the rim walls causing a pinch flat. 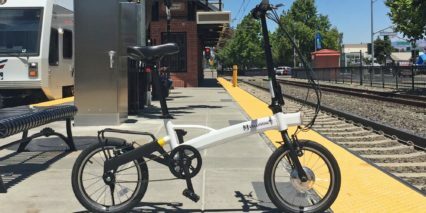 But enough maintenance talk, I’m emphasizing it here because of the nonstandard use that many folding bikes get, being taken to unfamiliar territory. Back to the motor, you get a top assisted speed up to 14 mph but I was able to pedal beyond this on smooth, flat terrain. I’m not sure I would regularly strive for higher speeds given the short handlebar and nimble but less-stable wheelset. It feels good at 10 to 14 and the single-speed drivetrain didn’t both me because twist throttle was always available to help with starts. 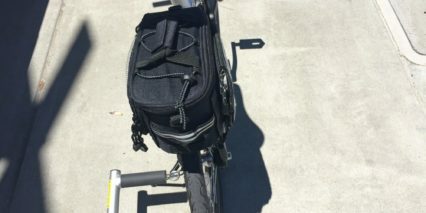 Note the plastic chain guide and cover which protects pants and dresses while keeping the chain on track during folds and carrying. The two complaints I do have about the motor are that it produces a distinct high-pitch whine when operating at full power and that it can spin the front tire briefly when starting (at least for me). 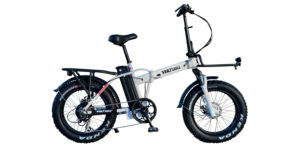 The world of electric bicycles is full of interesting, sometimes distracting, statistics and motor wattage is one of them. 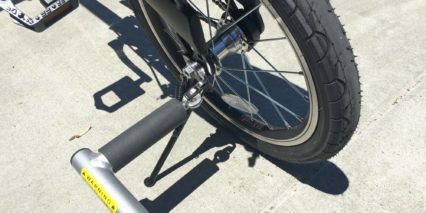 What may sound small and weak to one person, is actually the perfect solution here because the smaller wheels offer a mechanical advantage for starting and climbing and the reduction in power flow acts as a battery-sipper, extending range from eight or so miles using the throttle-only to eighteen or more if you ride at the lowest level of pedal assist. Given the cadence sensor and throttle setup here, this is a bike that can use more juice. The motor can feel sudden and even surprising at times if you jump to the highest level when starting out or completely open the throttle. 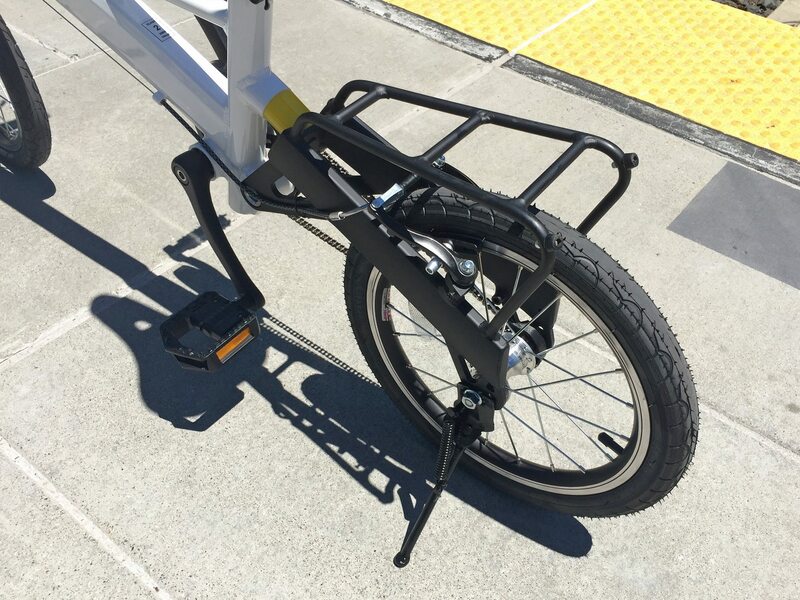 As shown in the video, you want to be extra careful with this bike anytime it is turned on. 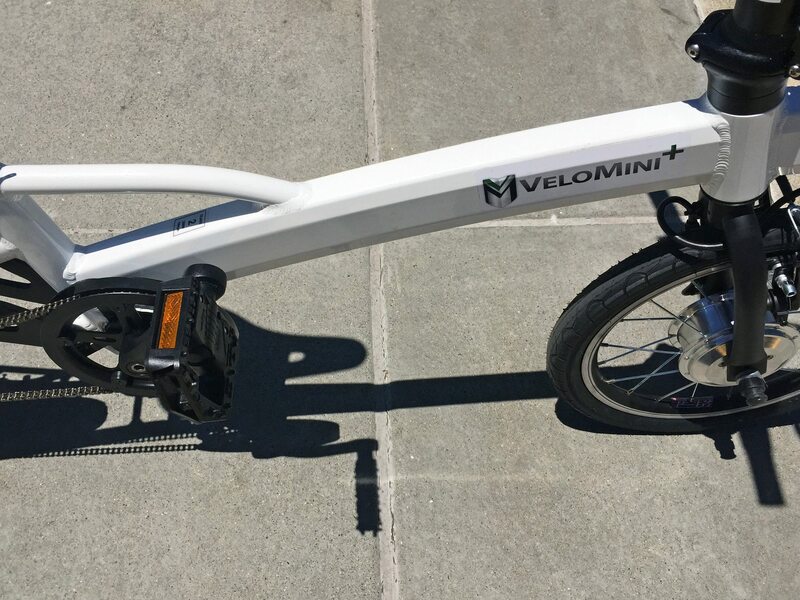 Brand new VeloMini’s tend to have their pedals rotate when you walk the bike forward… which sets off the cadence sensor and can send the bike zipping forward. This happened to me as I got distracted filming and forgot to arrow down to zero, but even in that mode the throttle would still be hot and it would be easy to accidentally activate the bike during folding or loading. 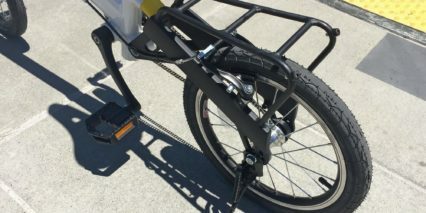 Given the extremely light 29.4 lb footprint, I never felt intimidated about the bike tipping over or taking off and hurting someone the way that I have with some other products. In fact, the bike did tip several times. 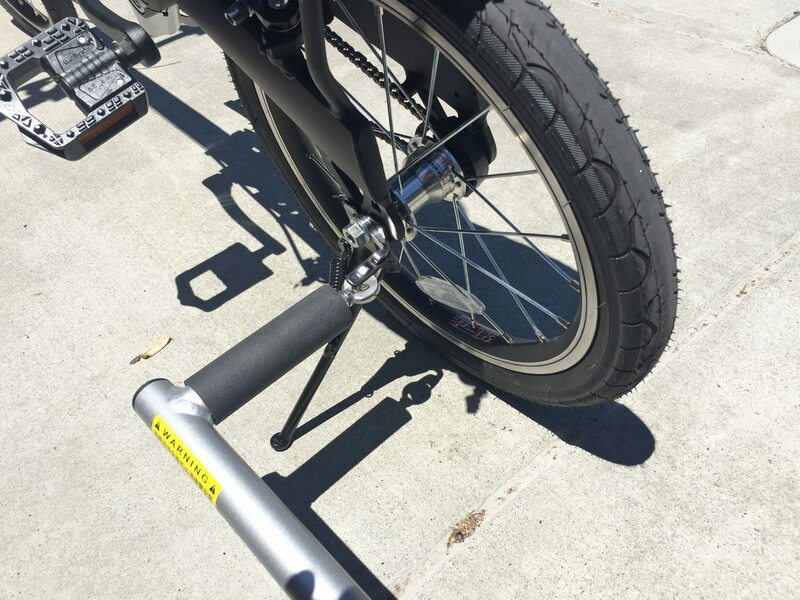 The kickstand is small and effective but strong gusts of wind, angled surfaces, and the use of that T-1 Rack are enough to let it tip. Thankfully, much of the weight that is added to this bike through the motor and battery is positioned low and centrally. 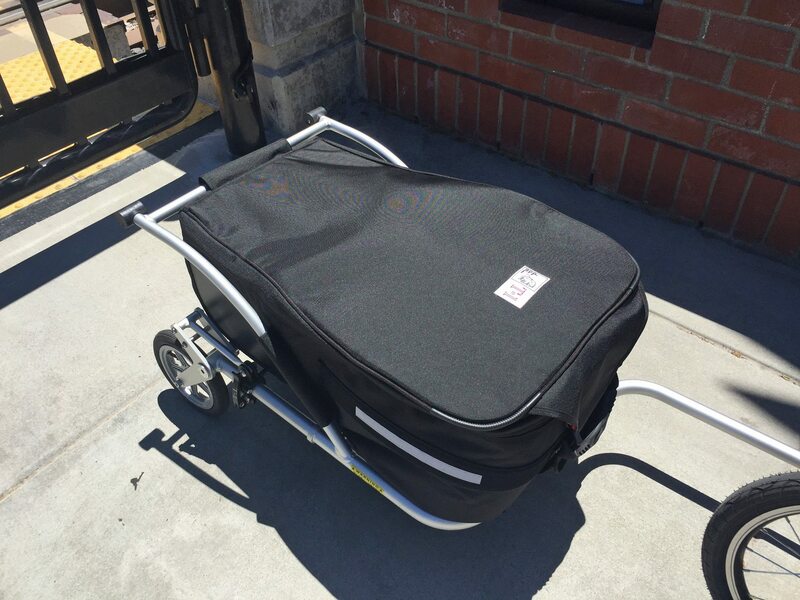 This is exactly what you want for balanced handling and predictable lifting and stowing. 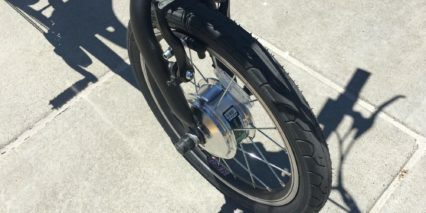 The battery itself only adds three pounds to the bike and is completely hidden inside the main tube. 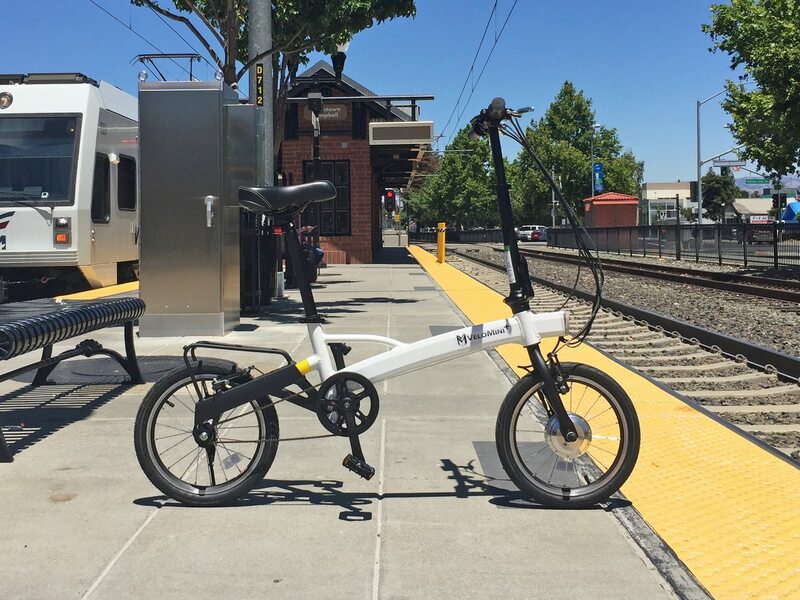 It looks better than the majority of other folding bikes and practically disappears… helping you blend in and avoid questions and unwanted attention. Note that the battery can be removed for service and replacement by taking the headlight off and sliding the stem out. It’s not something you should plan to do regularly but it’s nice that you can, to keep the bike going for years to come. You get 24 volts and 10 amp hours with this pack, quiet a bit less than the traditional 36 volt 10 amp hours on full sized products, but they had to save weight somewhere and the energy-dense Lithium-ion cells are long lasting. Store the bike in cool, dry locations at ~80% to maximize life. Check on it every month or two if you haven’t used it and fill it back up to 80% if it has dropped down. 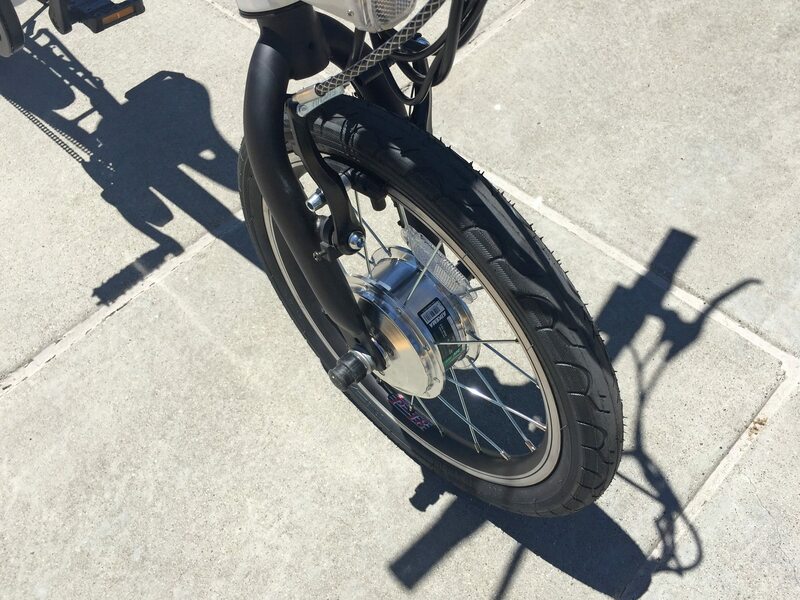 Operating the bike requires two steps once the battery has been charged up. You stand over the frame and click the red toggle switch from the circle to the line on the right side, near the right grip. This switches on the battery pack, now you can hold the little power button on the control pad near the left grip. Once it is powered up, the five-bar battery infographic will light up and the headlight will come on if it’s dark out. At this point, the throttle is live and you can use it to zip along smoothly up to ~12 mph. For a more natural ride, and to give your wrist a break, press the plus button on the control pad to select one of three levels of pedal assist. The highest level of assist “High” gets you up to 14 mph and I recommend working your way there vs. starting the bike in high power mode from a standstill. This is the mode I used for the ride tests in order to demonstrate the towing and climbing power of the bike. And again, you could hear the electronic whir of the motor but don’t be too concerned, some of my frame shots amplified it. The reality is that road noises and even the tires and clicking of the pawls in the freewheel mask it pretty well. If you want to go slower, use the minus button to decrease power and once you’re done, hold that power button again and click the red toggle switch. I would prefer just one power switch on this bike but understand the separation of battery power flow from electronic controls. 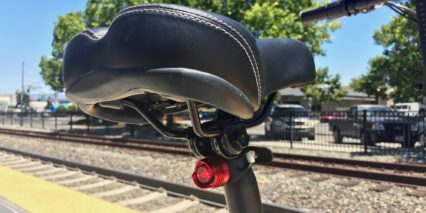 Many cheaper bikes have this sort of thing and at least both switches are easy to see and reach on the VeloMini Plus. 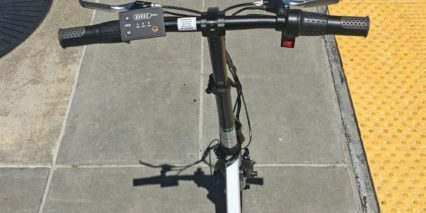 Other products require you to reach down or back and sometimes even get off the bike to click a switch, which can be inconvenient. The VeloMini+ isn’t a perfect bike for every occasion but I appreciate that it doesn’t try to be. 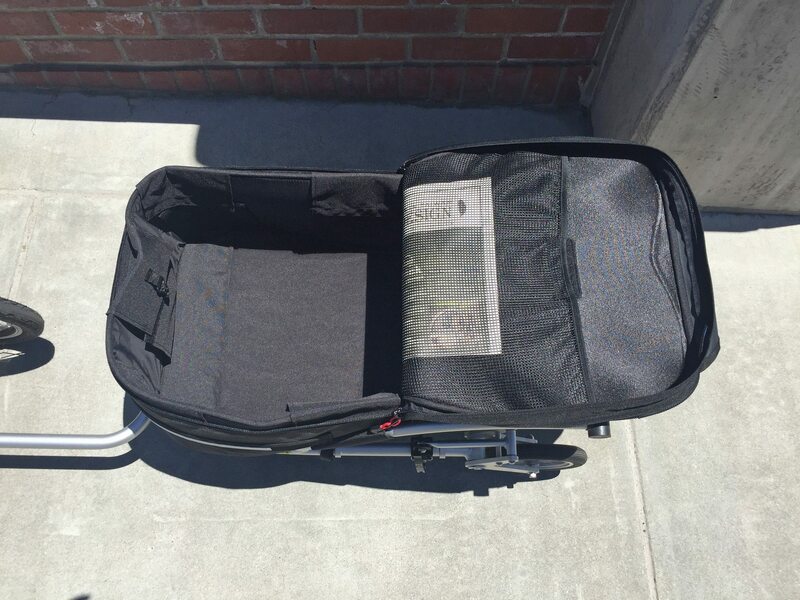 It’s light, easy to fold, compact, and simple to use. The included canvas bag keeps it clean (or hides the fact that it’s dirty if you’re getting onto public transportation) but I felt the bag was annoying to zip. Maybe future bags will be a little looser or this one was just so new that it hadn’t filled out yet? Having an integrated headlight is wonderful and the very basic independent rear light was welcome but I’d probably wear a larger one on my backpack or helmet. 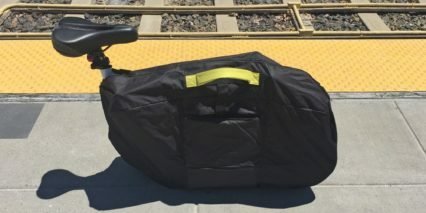 The optional trunk bag and trailer have reflective tape on them and were both perfectly sized and matching for use with the VeloMini. With only one size and one color option, I didn’t feel like I was sacrificing much in the way of fit or style. This product is professional and timeless vs. cheap and tacky. I’m glad the rear rack is welded on vs. bolted because it felt solid and even had some rubber bumpers to protect it when folded under the frame. 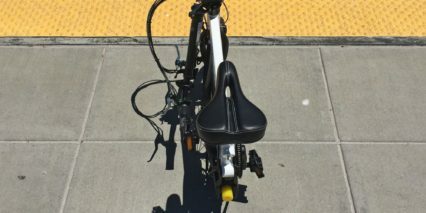 The yellow plastic bumper at the back offers a bit of shock absorption but the real superstar in terms of comfort is the saddle. It offers an inch or more of cushion support that is noticeable and welcome. Do I wish the optional trailer was cheaper? Yes, absolutely. But the product itself seems like a great value and I would definitely get the $29 trunk bag for the charger, my keys, a mini-pump with a pressure gauge like this and my wallet etc. 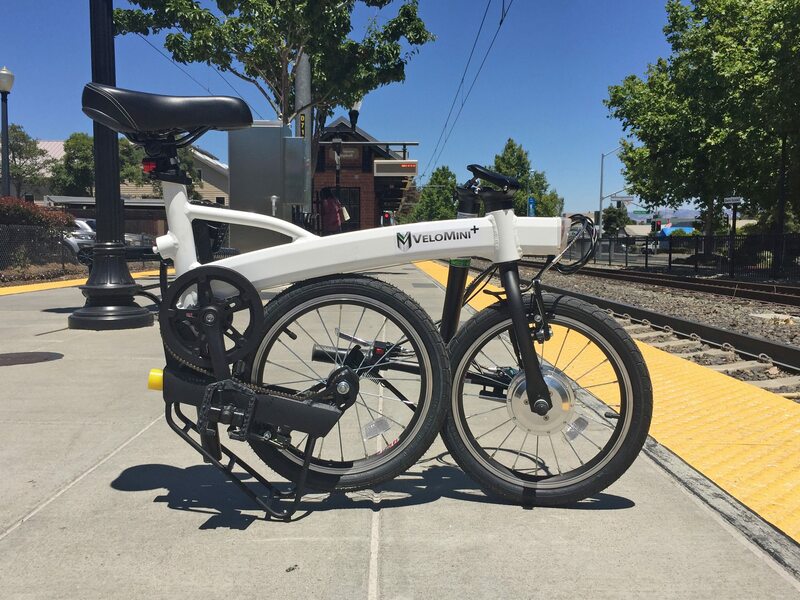 Big thanks to Doug, the founder of VeloMini, for partnering with me on this post and using me.. I mean inviting me to go along to the port to pick these things up! It was neat to see how products from Asia get shipped over and unloaded at the port (Berkeley California in this case). 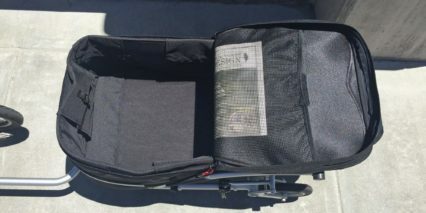 Having reviewed the older VeloMini products, I came away very impressed with the new Plus model and finding that I enjoyed riding it more than kick scooters and wearing a backpack for gear. 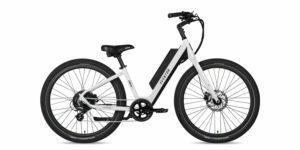 I bought a Canadian version of this bike called EBikeBC.com in Oct. 2016; see my video review here, and written review on EBR here, I paid ca. $775 US [$998 Cdn.] & free shipping (to Canada or US). 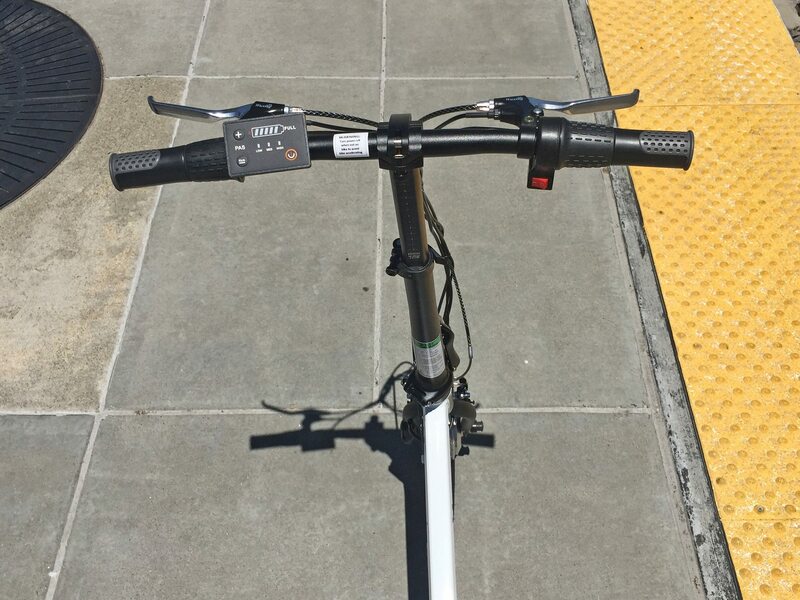 This model lacks a kickstand, and has a smaller control / readout. Note that mine is 24 lbs, not 29; and (besides twist-grip throttle) has only one control / readout, a red on-off button with three LED lights indicating battery fullness. Also, I think my charger is smaller. You are testing a lot of folding bikes. 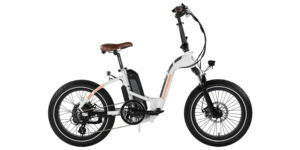 I had been looking at the Genesis Commuter ebike. They go for $799. But, when I got looking closely, and emailed the seller, I found that the battery was not made to be removeable. Not interested. Then I stumbled on the ibike Metro XT. It looks a lot like the Genesis Commuter. When I looked closer, I found that the Metro XT does have a quickly removeable battery. It also comes with disk rear brakes (the Genesis doesn’t). The Metro XT sells for $899. But, get this, for that price it includes a spare battery, and free 2 day shipping. They give 38 miles maximum range on pedal assist. With the spare battery fully charged in a backpack, this thing could have quite a range. Hey Court! Love your videos and reviews! I actually came across your website while browsing the prius subreddit, great set up you’ve got. 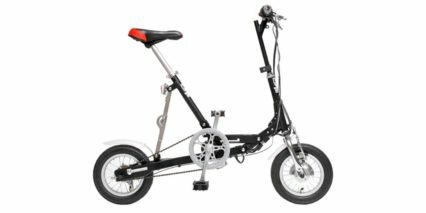 I have a question regarding the velomini- is it pretty comfortable to pedal when the motor is off? 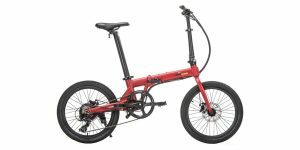 I am looking for an electric folding bike that is also smooth and fun to pedal as a regular bike. Thanks a bunch! Dope! I’ll have a look. Thanks for the reply. 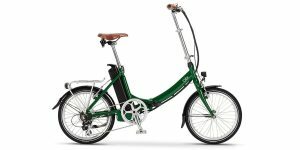 Hi Court, looking for a pedal assisted bike for my dad for some exercise. He is 69 now and he is short. so looking for wheels smaller than 20″ so that his foot can touch the ground. 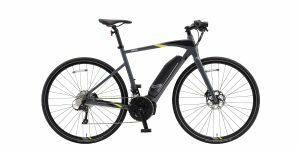 Any recommendation besides Velomini plus and BLIX Vika travel? THANK YOU! Cool! 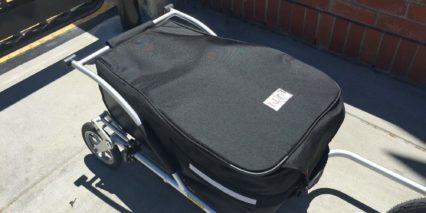 Can’t wait to check out your review of the Vika Travel. I have already watched your review of Vika Plus, the brother of Vika Travel. It was a great video with super nice weather in CA. The testing part of hill climbing is so impressive! 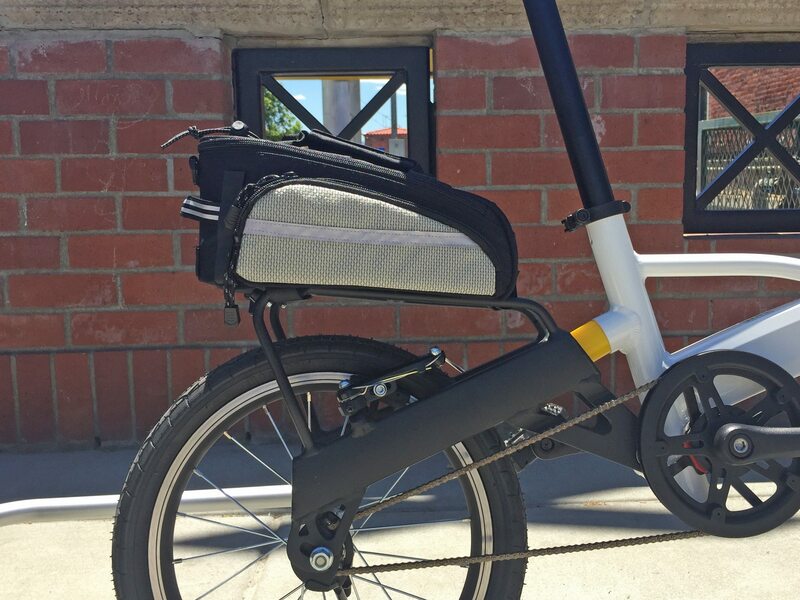 BTW, I came across Sondors mini folder during my research, this bike will be released in June (so nobody see the real bike yet!). 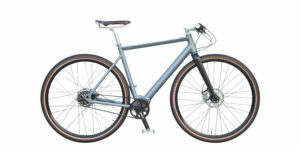 Only half the price of Vika Travel with front suspension, seems great value for money. 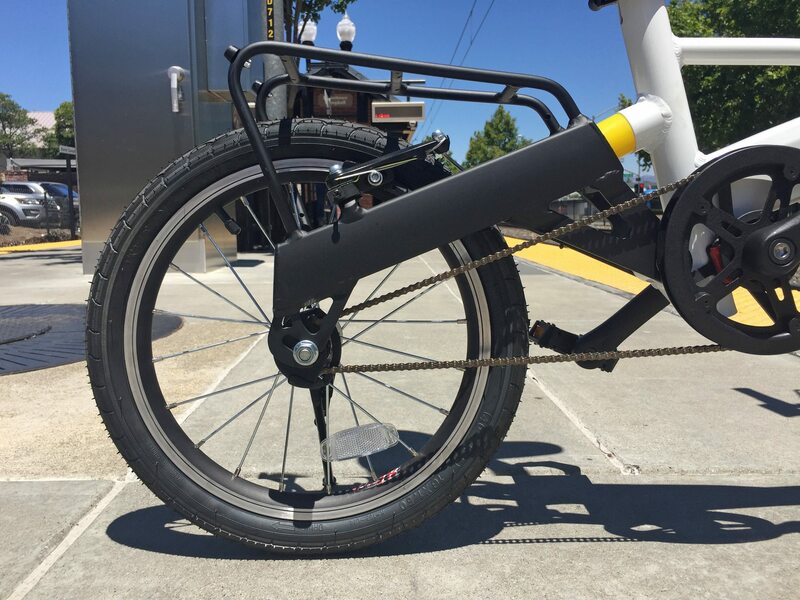 And from your earlier review of Sondors Thin, its build quality seems pretty solid. However I don’t know the durability of Sondors bikes, and can’t find too much info about ownership of their earlier models. 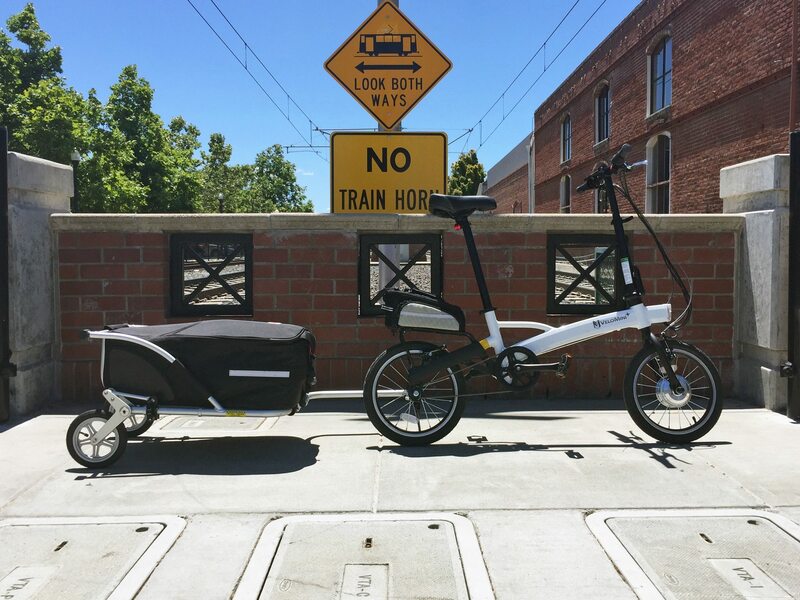 Curious to know if Sondors bikes would last as long as other established brands. Also their very limited return and warranty policy concerns me a bit. Feel free to shot me an email!